On a gorgeous, 70 degree day with just the hint of a cooling breeze, the prospect of a final between one of tennis’s most touted up-and-comers and a wily, former Top 100 veteran promised much. 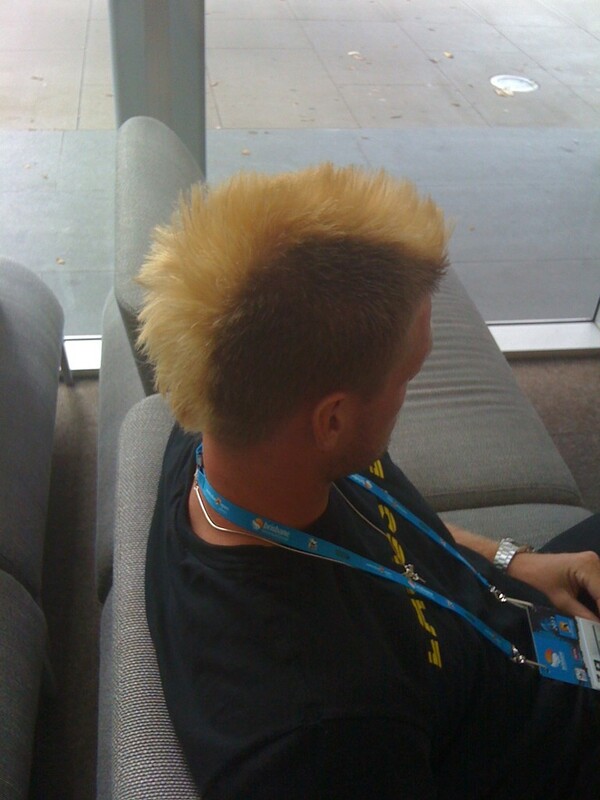 And, for two-thirds of it anyway, 19-year-old Kyle Edmund and 31-year-old Victor Crivoi delivered on that promise. The two had met almost exactly one year ago, with the pair splitting two tight sets before the elder Romanian cruised to victory in a lopsided final frame. So the question was: how much difference would a year make, with the younger Brit having risen about 200 spots in the rankings in that time? The answer, surprisingly, turned out to be: not much. From an Edmundian perspective, the match unfolded in opposite fashion from his semifinal win against Isak Arvidsson — rather than having to work his fearsome forehand into a good groove, he started out firing on target early and often. And then it started going awry. But at the outset, the Brit’s favorite shot was working well, and he claimed the first break of the match with an off forehand winner that was anything but off, eliciting a gasp from one of the patrons as he secured a *2-0 first set lead. The fourth game featured a bit of a mild controversy, as the 31-year-old veteran pulled a 0-15 backhand crosscourt wide, only to walk up the sideline and point to a mark from Edmund’s previous shot that he claimed was wide. After examining the mark, the chair umpire reversed his original call, giving the point to Crivoi instead. Kyle rightly pointed out that Crivoi had played on and hadn’t stopped the point to challenge where his opponent’s ball had landed. Nevertheless, the point was deemed in the Romanian’s favor, and he held to 30 to join Edmund on the scoreboard. The next two games just seemed like the 6’4” Beverley boy was showing off; two aces and two forehand winners to hold for 4-1*, then another three forehand finishings to break for *5-1. This had all the makings of a rout, and Edmund had 10 outright forehand winners in the first five games in addition to the assorted times he’d forced his foe into errors from that wing. But the top-seeded Crivoi, currently ranked #232 but with a career high of #75 in 2009, was not to be finished off so easily. A wily tactician, he began exploiting Kyle’s ad-court shading by deliberately playing backhands down-the-line into Edmund’s forehand corner, catching him out and stretching him wide, forcing errors. Two such rallies, as well as two forehand miscues from the Brit, contributed to Crivoi getting one of the breaks back. With Edmund’s initially reliable forehand leaking errors, and Victor’s variance of the rally patterns (including a few drop shots creeping into the mix), the 31-year-old chiseled his way back to level in the 1st set at 5-all. Serves were held, and a tiebreak undertaken. In the buster, the Brit ceded a mini-break with a netted backhand volley (a shot that plagued him the few times he attempted it), and went down 0-2*, only to reel off the final seven points for a — any guesses? That’s right! — 7-2 TB win. The last three points went: Edmund down-the-line forehand winner, Edmund service winner, Edmund forehand crosscourt winner. Winner winner, chicken dinner. 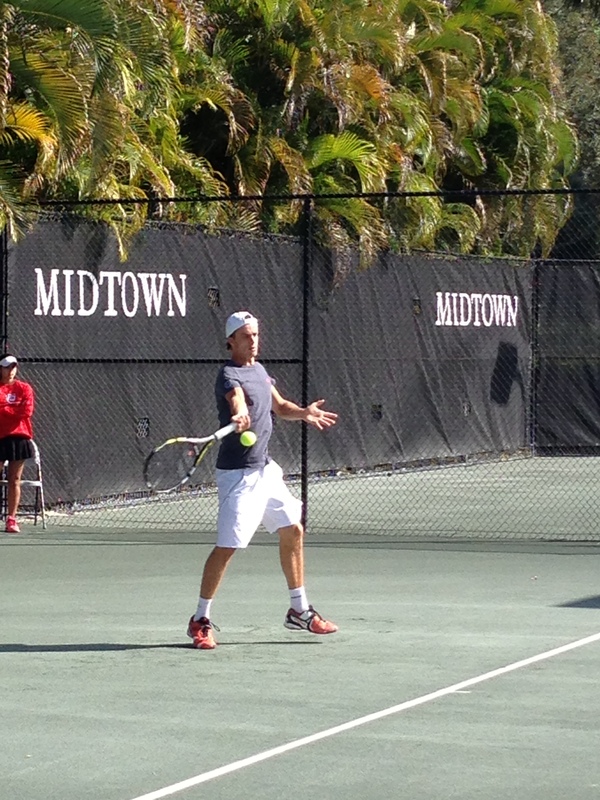 It’s finals day at the USA F3 Futures in Weston, FL, where top-seeded Romanian Victor Crivoi is set to meet fourth-seeded British upstart, Kyle Edmund. 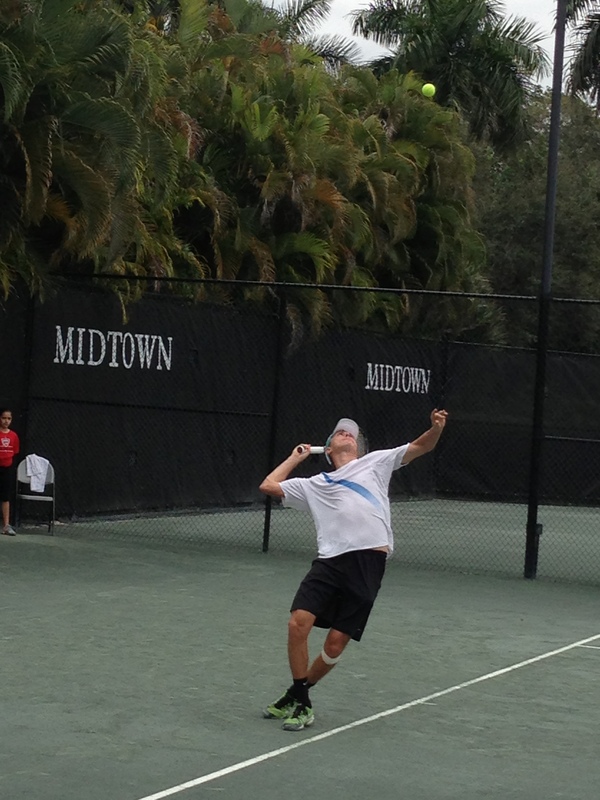 Edmund comes in riding a nine match win streak, having taken the title at last weeks USA F2 event in Sunrise. The 31-year-old Crivoi has had almost as good a start to his year, posting a 7/1 record thus far for 2014, his only loss coming to another teenage up-and-comer, 18-year-old Yoshihito Nishioka from Japan. The two have a history, with Crivoi coming through a 6-3 6-7(4) 6-1 encounter at last year’s USA F1 tournament in Plantation, Florida. Both players overcame scratchy patches in their semifinal matches yesterday, but they each finished strong. It’ll be interesting to see what difference, if any, is made one year on. After a two-week hiatus during which my own body let me down, I decided to drive down to Weston, FL to see what all the healthy people were up to. 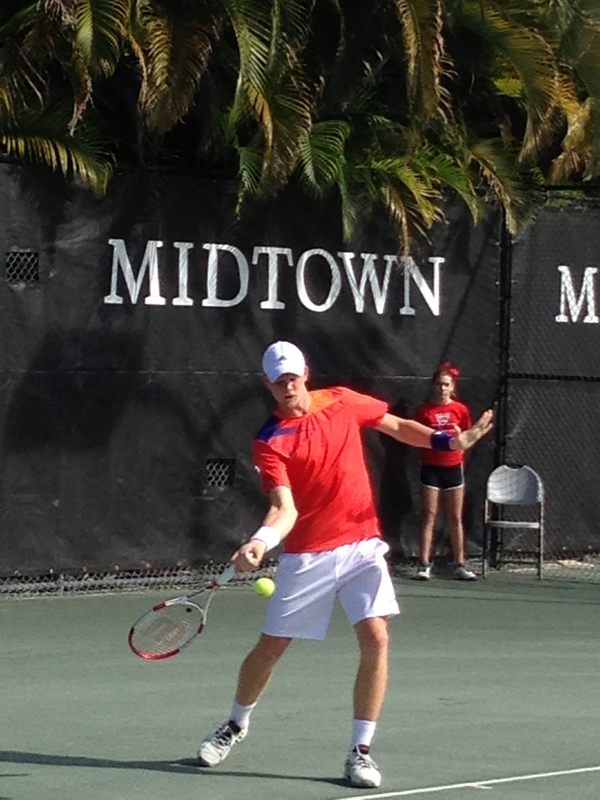 Some of them, it turns out, were at the Midtown Athletic Club contesting the semifinals of the most prestigious* of the first four stops on the USTA Pro Circuit Futures tour. The first guys to be thrown into able-bodied court combat were the top seed, 31-year-old Romanian Victor Crivoi, against his decade-younger opponent, the third-seeded Belgian Arthur De Greef. This would be a rematch of their only previous meeting, another semifinal encounter on these very courts last year, when Crivoi was the one on getting the grief, receiving a 2 & 1 thrashing at the hands of the youngster. Crivoi, currently ranked at #232 but with a career high of #75 in 2009, entered the match with a 6 win, 1 loss record — that loss attributable to Yoshihito Nishioka — while this is the first tournament of the year for de Greef, the 21-year-old former Top 20 junior and Orange Bowl finalist. There was not much to distinguish the two from the outset, scorewise — both guys saved a couple of break points early, and serves were held through the first seven games. Gamewise, De Greef flights the ball with more height over the net than Crivoi and an almost Nadal-like amount of topspin off his forehand side, while Crivoi’s shots penetrate a bit more zippily and the Romanian looks for opportunities to come forward often. And while the Belgian can smack his first serve a fair bit, it hardly ever seemed to trouble his veteran opponent, who put a lot of returns into play. De Greef apparently thought the eighth game was as good a time as any to break himself, so he set about accomplishing the task with two backhand unforced errors sandwiching a forehand miscue from 15-all. Crivoi subsequently served out the set. The second set unfolded much as the first did, with both men saving a break point in the early stages, until the sixth game, when Crivoi lost control of his forehand to the tune of some shanking and smothering. De Greef hit a terrific inside-in forehand winner to set up three break points, but only needed the one, and the Belgian went on to take the second frame 6-3. The third set was also decided by a single break, this one secured by Crivoi in the sixth game when his Belgian foe started forehanding a little too lengthily, yielding two break points. Crivoi cashed in the first with one of his many forecourt junkets, forcing his Belgian foe to miss his forehand pass attempt just wide. Though he’s far from being a seeming relative of Oscar De Grouch, De Greef is quite a chattery fellow who’s prone to some bouts of self-berating shouts. To be fair though, both guys had their share of extended, impassioned soliloquies on this day as they battled on the Weston clay. But it would be Crivoi’s day in the end, fittingly closing out the match with an overhead for a 6-3 3-6 6-3 win.